A growing number of croquet players are playing eXtreme croquet. Lightweight recreational mallets are not up to the task of this grueling version of the game. To address their needs, the eXtreme mallet was born. Using a full size ash shaft for full size players, our skilled mallet-smiths have fabricated an indestructible high density polyethylene head. Using the "Taper-lock" fastening system, this pairing makes for one tough mallet, able to withstand the most eXtreme conditions thrown at it. 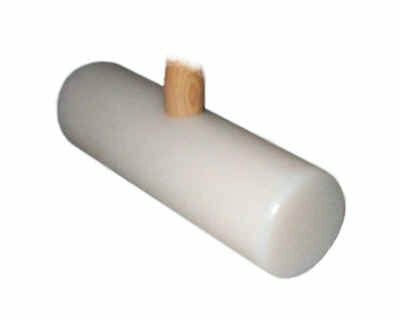 The mallet has a round head, 2-1/2" in diameter. Its weight is about approx. 2 lb - 8 oz Head size 8-1/2"